Aerial inspection was carried out on 22 August, after the 16 August, M 7.8 earthquake that struck 100 km to the W. The inspection revealed profuse white vapor coming from large-output fumaroles in the main fumarole field of the stratovolcano's summit amphitheater. In contrast, emissions at Crater B were moderate and from diffused sources. Recent landslides were noted in two of the summit craters. The more extensive slides were on the W wall of Crater B. These landslides were thought to have been caused by shaking during the 16 August earthquake. In general, the visible activity at Balbi appeared to be similar to that observed during previous inspections in the late 1980's. However, emissions may have been more voluminous in 1995. Balbi marks the highest point on Bougainville Island, forming a summit composed of coalesced cones and lava domes and hosting a large solfatera field. Interviews with local inhabitants suggested that Balbi's last eruption took the lives of a number of people in about 1800-1850. Information Contacts: K. McCue, Bougainville Copper Ltd., Panguna [with January 1988 additions from RVO]. "A brief aerial inspection of Balbi was made on the 27th. No changes were noted. Voluminous white emissions continued from the 1-km-long fumarole field in the NE part of the summit amphitheatre, and from sources in one of the summit craters (Crater B)." The large Balbi stratovolcano forms the highest point on Bougainville Island. The summit of the complex andesitic volcano is part of a large number of coalesced cones and lava domes. Five well-preserved craters occupy a NW-SE-trending ridge north of the summit cone, which also contains a crater. Three large valleys with steep headwalls dissect the flanks. The age of the most recent eruption is not known precisely. An oral tradition of a major eruption during the 19th century is now thought to be in error, but could refer to minor eruptive activity from this relatively youthful-looking volcano. Fumaroles are located within 600-m-wide Crater B and on its W flank. [ 1825 ± 25 years ] [ Unknown ] Uncertain Crater B ? There is no Deformation History data available for Balbi. There is no Emissions History data available for Balbi. The broad, complex Mount Balbi stratovolcano is seen here in profile from the village of Wakunai, east of the volcano along the NE coast of Bougainville Island. 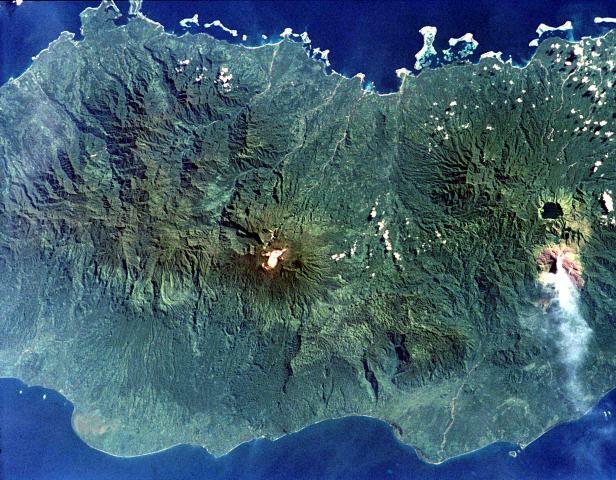 Balbi, the highest and largest-volume volcano on the island, has an elongated profile resulting from the formation of a NW-SE-trending chain of volcanic vents. The age of the most recent eruption of Balbi volcano is not known precisely. An oral tradition of a major eruption during the 19th century is now thought to be in error, but could refer to minor eruptive activity. Photo by Wally Johnson, 1987 (Australia Bureau of Mineral Resources). 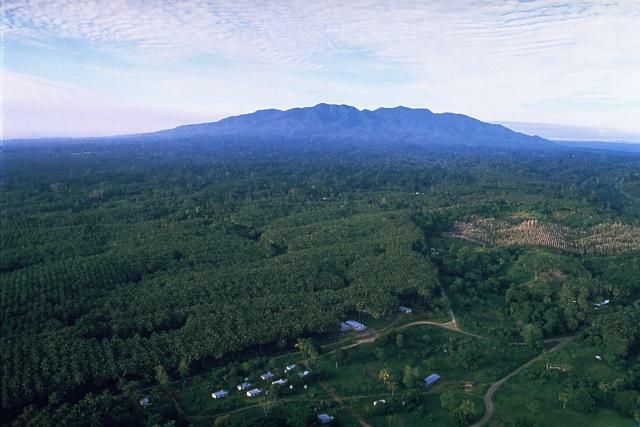 The massive Balbi stratovolcano forms the highest point on Bougainville Island. The 2715-m summit of the complex volcano is part of a large number of coalesced cones and lava domes. 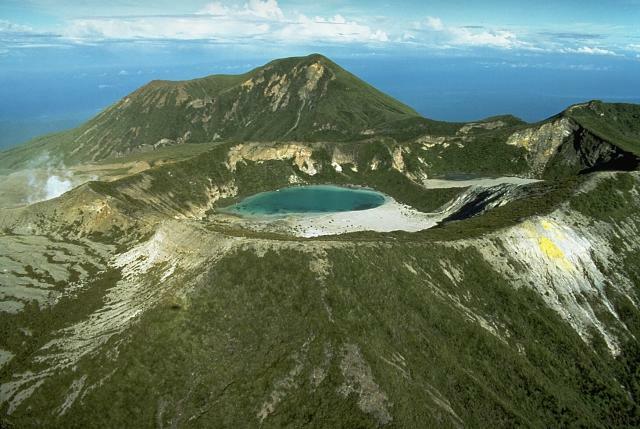 Five well-preserved craters occupy a NW-SE-trending ridge north of the summit of the volcano, which also contains a crater. Crater C, containing a small lake, is seen here from the east. Steam from a fumarole field on the western flank of 600-m-wide Crater B is visible at the left. The latest eruption of Balbi may have been as recent as the mid-19th century. Much of the left side of this NASA image with north to the upper left is covered by volcanic products from Tore volcano in the Emperor Range on NW Bougainville Island. The Tore massif lies to the left of the light-colored area at the center of the image, Balbi volcano. Two Pleistocene ignimbrites from Tore formed a broad fan that extends the coastline to the west (lower left). The dark-colored caldera lake of Billy Mitchell volcano is at the right, above an ash plume originating from Bagana volcano. NASA Space Shuttle image ISS001-358-32, 2001 (http://eol.jsc.nasa.gov/). There are no samples for Balbi in the Smithsonian's NMNH Department of Mineral Sciences Rock and Ore collection. Large Eruptions of Balbi Information about large Quaternary eruptions (VEI >= 4) is cataloged in the Large Magnitude Explosive Volcanic Eruptions (LaMEVE) database of the Volcano Global Risk Identification and Analysis Project (VOGRIPA).